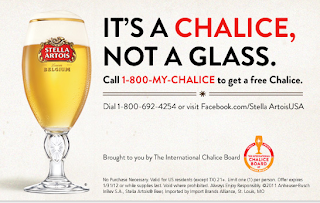 Call 1-800-MY-CHALICE to request to request your free chalice. It may take a while to get thru, they are getting a ton of calls - so be patient and keep trying! No purchase necessary. Valid for US residents except Texas - sorry, no idea why? You have to be over 21 years old. Limit one per person. Offer expires January 31, 2011.